This can be fun! Sit down together with your favourite holiday treat and some Christmas music in the background, and share all your favourite traditions. As each person shares, write down what they say, so you end up with a great list. It will end up being kind of like a Christmas "bucket list". Or there are free printable holiday bucket lists available online. 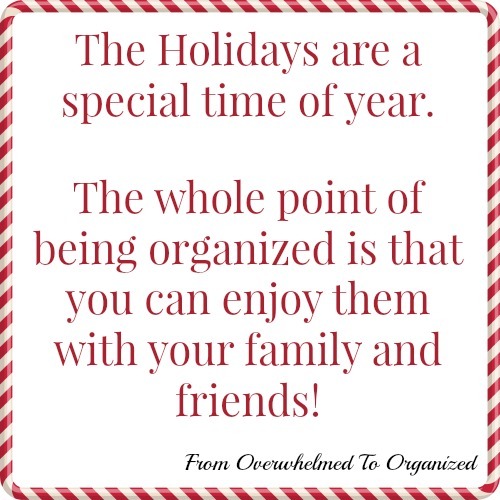 So check out my Christmas Organizing board on Pinterest to choose one that will work for you! Maybe your kids heard about something fun that their friends do during the holidays. Or you found some ideas on Pinterest you'd like to do this year. They don't necessarily have to be brand new activities, but maybe changes to existing traditions. For example, if you enjoy baking together during the holidays, maybe you add 1-2 new recipes into the mix of traditional ones. Or if you have a weekly family movie night, you could watch a few new movies as well as those favourites you watch every year. Add your new ideas to your list from step 1. Who knows? These may end up being new traditions! In our family, we added a new tradition 2 years ago to unwrap a Christmas book every evening during the month of December as a kind of advent "calendar". I wasn't sure if it was worth the time to wrap the books, but my kids loved it... especially my daughter. It adds to the excitement of reading before bed and all our books get read, instead of just a couple special ones. In the process of reading new books, we found some new favourites! If your list is too long to actually do in the time you have available, have each person choose their top 3 ideas so you know everyone is going to be happy doing those things. You can adjust that number to fit the time you have (depending on how far ahead of Christmas you make your list, what your family's schedule is like during the holidays, etc.). There may also be overlap in family members' favourite traditions, which is great! Making memories together is what makes traditions so special. 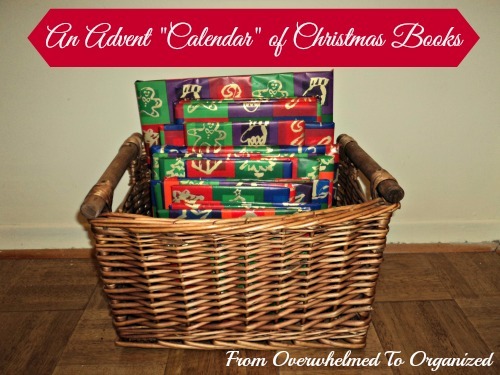 You don't want your holiday season to be so busy that you are overwhelmed and don't enjoy it. Try to keep your traditions simple. You can gradually phase out some that your family is less interested in (or that they've outgrown). Don't introduce new traditions that will involve a lot of time or energy on your part (like that darned elf... there was no way he was ever going to visit our home... I'm busy enough at Christmas to be dealing with him on a daily basis!). Find ways to combine traditions if possible. Listen to your favourite holiday songs while you're driving around looking at Christmas light displays. Sip on hot chocolate and munch on favourite treats, while watching your favourite holiday movie. By doing this you can keep multiple people happy and enjoy more of your Christmas traditions without having to fit them into a busy schedule. Or, modify a tradition to make it simpler and more enjoyable. 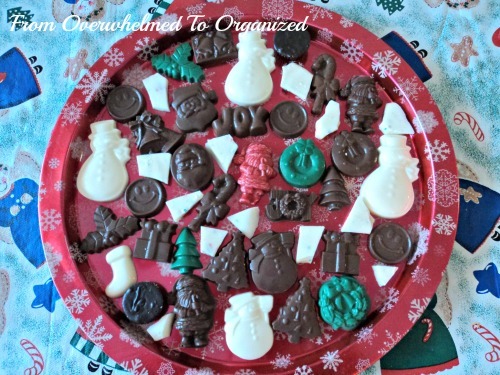 For example, we make chocolates every year (I've been doing it since I was a teenager). It's a long-standing tradition that my husband joined in when we got married and now my kids have joined the fun too. We used to decorate the chocolates with different colours. Things like red berries on the holly leaves, white beards and red hats on the Santas, and red bows on the bells and wreaths. They turned out really pretty, but it was a lot more work, took a lot longer, and it was too hard for my kids to do. The last few years we've just made plain chocolates (still different colours, but only one colour per chocolate). And you know what? They still taste just as yummy :) 0making this change means I get to enjoy this tradition with my kids. And other traditions too because we finish in a few hours instead of taking days. It was a small change, but it allows us to make memories together, without sacrificing too much. We're keeping it simple. There are so many events that happen in December! Some of them you have to attend, but, you can also probably say no to some of them. Protect the time you want to set aside for your family traditions. It may be hard to say no to some things, but in order to say yes to the activities on your family traditions list, you will need to say no to other things. Do this as firmly but lovingly as possible, especially when family or close friends are involved. You don't have to go into details as to why you're choosing not to do something. A simple, "We've booked time for our family to ____ instead." will do. Keep the focus on what you will be doing, not what you are missing out on. When you look back on your Christmas season, you'll be glad you did. Now that you know what you want to do this Christmas, schedule each activity in. Spread them out throughout the holiday season so you'll be able to do as many of them as possible. You may need to be flexible with this, but by scheduling your traditions, you'll be more likely to actually do most of them. Otherwise your time will fill up and you'll be looking back on your season wondering why you didn't do many of the traditions on your list. 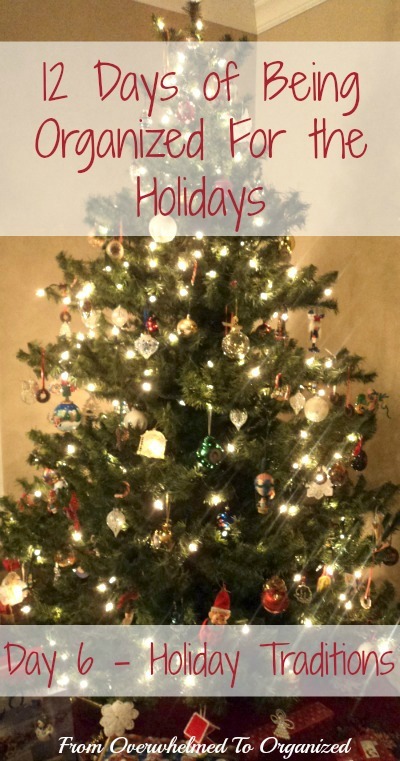 So your task for today (or as soon as possible), is to organize your holiday traditions. Make your list with your family and schedule in time for your traditions. What are you favourite traditions for the holidays? What can you say no to this year so you can enjoy more of your favourite traditions? How do you keep your traditions simple? Great resource for families! We don't have kids so a calendar is enough for us but I know things get tough when more people are in the mix! love number 5. I am totally checking out your pinterest board for printables too! Pinned this. I'm so last-minute with everything this year. I wish I would've seen this post about a month ago! Thanks for the great tips. I pinned it.